Benicar attorneys Rhett McSweeney and David Langevin are providing free legal consultations to individuals and families injured or harmed as a result of the use of Benicar, a commonly prescribed blood pressure medication. If you or a loved one has been injured by the use of Benicar, call 1-877-542-4646 or use our private contact formto receive a free, confidential legal consultation. Between 2008 and 2011, researchers at the Mayo Clinic in Minnesota performeda study on celiac disease and observed that a large number of participants were on olmesartan medoxomil drugs like Benicar. These participants exhibited symptoms consistent with celiac disease, but their symptoms disappeared when they stopped taking Benicar. In a 2013 safety announcement, the U.S. Food and Drug Administration warned that the blood pressure drug olmesartan medoxomil (marketed under the names Benicar, Benicar HCT, AZOR, Tribenzor, and others) can cause intestinal problems known as sprue-like enteropathy. This drug reaction can cause severe and debilitating health complications. 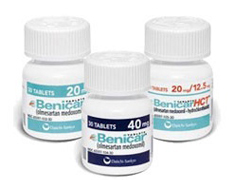 The side effects of drugs like Benicar can take months or years to develop. These effects can mimic the symptoms of celiac disease and, because of this, reactions to Benicar are sometimes misdiagnosed. You may be entitled to compensation for medical bills, lost wages, pain and suffering and other damages if you or a loved one has suffered any of the above symptoms. Feel free to contact a Benicar attorney at 1-877-542-4646 or by using the form below. Your information will remain confidential and a Benicar lawyer will provide you a free legal consultation. Our Benicar attorneys handle cases throughout the entire United States: Alabama, Alaska, Arizona, Arkansas, California, Colorado, Connecticut, Delaware, Florida, Georgia, Hawaii, Idaho, Illinois, Indiana, Iowa, Kansas, Kentucky, Louisiana, Maine, Maryland, Massachusetts, Michigan, Minnesota, Mississippi, Missouri, Montana, Nebraska, Nevada, New Hampshire, New Jersey, New Mexico, New York, North Carolina, North Dakota, Ohio, Oklahoma, Oregon, Pennsylvania, Rhode Island, South Carolina, South Dakota, Tennessee, Texas, Utah, Vermont, Virginia, Washington, West Virginia, Wisconsin and Wyoming.